Fig. 6.1. Cougar Pass Fire Lookout. Photograph by Bob Zybach, October 10, 2018. Cultural Resources of the Elliott State Forest are physical evidence of a place or the past of human activity such as a site, object, landscape, or a structure that is over 50 years of age historically. There are multiple locations within the Elliott State Forest that people can go and experience these cultural resources such as the Cougar Pass lookout, Elk Horn Ranch, the roads built by the Civilian Conservation Corp, Indian trails, as well as hunting trails (Phillips 1998: 372-395). The roads you drive on while inside the Elliot State Forest boundaries were built prior and after World War II. Mostly built by the CCC (Civilian Conservation Corp.) The men in the CCC went off to fight during World War II leaving unfinished roads. After the war roads were constructed again and finished. In the 1960’s roads also were built after the Columbus Day Storm to salvage timber that was lost in the storm. There is no known quantity of people that use these roads due to no polls or surveys. Anybody can access the Elliott from one of the numerous locations such as Lakeside, Allegany, or Reedsport. There are over 500 miles of road within the Elliott State Forest itself. The first Cougar Pass lookout tower built was it 1935 and can be accessed by a hiking trail. It was used for about fifty years and was decommissioned in 1985. Today the sixty-foot tower still stands with rotten boards and keep out signs surrounding it. There is no known amount of people that see the Cougar Pass lookout. The West Fork of the Millicoma River fish hatchery can be accessed by Allegany and is still being used for Coho Salmon and is an ideal place for Steelhead and Cut-Throat Trout fishing. Many people go to the hatchery and help with the local S.T.E.P program (Steelhead Trout Enhancement Program). And can be an ideal place to swim during the summer. Access Permit- Fee to enter the Elliot State Forest Recreation area. Parking Permit- At a site a fee for parking. Grants- Potential donations made by an organization to help for development. 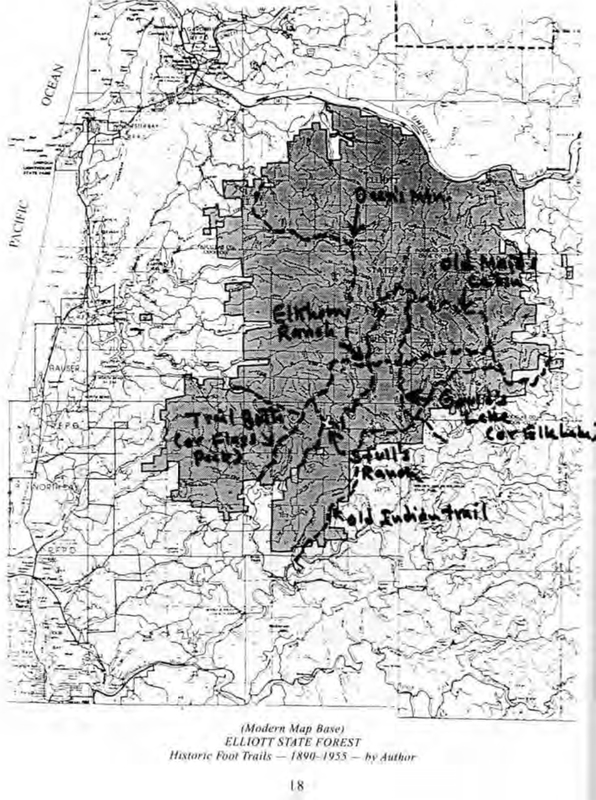 Educational Activities- A part of Oregon history can be visited in the Elliott State Forest and see the locations as stated above. Funding- In order to establish a recreation site or help manage and enhance cultural resources funding is needed for development. Location- Access to these sites. How the difficulty getting to a location is. Is the ground easily accessible or difficult to enter these areas? Signs- Road signs and historical site signs explaining what was there. Interpretive signs are ideal for telling or informing a recreationalist about prior history, due to most of these cultural resources that were once there have been damaged or destroyed over time. Experience- Sightseer gets to see and experience historical marker. History can be a great way to learn and see what has happened in history. Camp Ground/ Park- Day park for a picnic area and a campground for overnight stayers. Map 6.1. Historic Trails of the Elliott (Phillips 1998: 18).